The brilliant thing about the Cornetto Trilogy is that these films have compelling storylines with characters that we care about before the craziness begins. We care about Shaun before he starts battling the dead (Shaun of the Dead). We care about Nicholas before he uncovers a crime syndicate in a small town (Hot Fuzz). 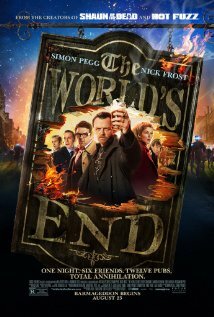 In The World’s End, that aspect of the movie is handled even better. As a putative horror-sci-fi tale, it takes a good long time before you see anything like a speculative fiction element on screen. You meet Gary (Simon Pegg), a man-child living a sad life of longing, longing for the glory days of his youth, when he and his mates nearly completed the Golden Mile, a twelve-pub crawl through their little town. After an epiphany of sorts, Gary tries to get the band back together to attempt the Golden Mile once more. The rest of the crew reluctantly agrees. (Nick Frost, Paddy Considine, Martin Freeman and Eddie Marsan.) Each has life far more grounded and mature than Gary’s, though each also has some reasons for regret of their own. This alone could have been the premise for an excellent film. Witty banter, dramatic reveals, even a long-lost love in the form of Rosamund Pike. Then, the robots happen. See, the boys’ hometown is now infested with mechanical devices that look just like the residents of the town, some unaged since 1990. A running gag in the film involves the invaders’ distaste for the term “robot”, so our heroes decide to call them “blanks”. There’s a lot of running away from blanks, and fighting them in restrooms, and paranoid discussions of who is still human. But it’s all still infused with the themes of lost youth and regret, not to mention laced with hilarious one-liners. Like Shaun of the Dead (though far less so in Hot Fuzz) the film balances the dramatic, comedic, and genre aspects beautifully. By the film’s conclusion, the dramatic and comedic elements begin to seriously drown out the genre elements. Not that there isn’t a big, science-fictiony conclusion to the conflict with the blanks, but it just doesn’t resonate as much as the rest of the story. It feels almost like a throwaway. All in all, The World’s End is a good film. It just doesn’t have the “timeless classic” feel of Shaun of the Dead.